STATESVILLE, N.C. – Photo Courtesy Getty Images – GMS Racing stopped time in the NASCAR world for a moment or two on Saturday when they announced that 62-year-old Bill Elliott, a 44-time NASCAR Cup Series winner and 1985 champion, will return to NASCAR racing at Road America when the Xfinity Series rolls into town on Saturday, August 25th. He suggested that this upcoming Xfinity start in the GMS Racing No. 23 ISM Connect Chevrolet for the Johnsonville 180 could be considered his “retirement race” from NASCAR’s national series. Elliott will be making his first NXS start at Road America. The Dawsonville, GA native has a total of 43 NXS starts, one win, eight top five finishes, 16 top tens and two pole awards. Elliott will also run the Trans-Am series at Mid-Ohio, citing a desire to see what some other types of racing are like. He says he has nothing to prove, so he just wants to have fun and enjoy the opportunities. GMS has had several drivers behind the wheel of the No. 23 car since driver Spencer Gallagher was suspended by NASCAR following his win at Talladega for violating the sport’s substance abuse policy. 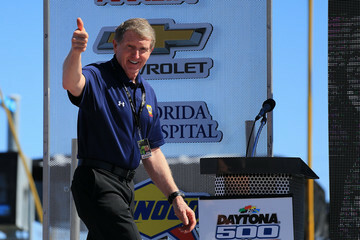 Gallagher has since completed NASCAR’s Road To Recovery program, and has been cleared to race. However, the team had already contracted several races out to other competitors, and drivers including Chase Elliott, Johnny Sauter, Justin Haley and A.J. Allmendinger have seen duty behind the wheel. Gallagher, interestingly, is starting the Go Bowling At The Glen event today, racing for the first time in the Monster Energy Cup Series in the BK Racing No. 23 (they ironically didn’t even have to change the number). GMS team General Manager Mike Beam has put in a bid to purchase the assets of BK Racing, and has said if he is successful, the team would become an affiliate of GMS.